Jessica Kingsley Publishers, 9781785927010, 160pp. 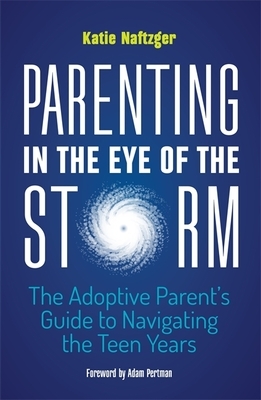 Adult adoptee and family therapist Katie Naftzger shares her personal and professional wisdom in this guide to help adoptive parents remain a calm parental influence in the midst of stormy and erratic teen behavior. This guide describes the essential skills you need to help your adopted teen confidently face the challenges of growing up and outlines four key goals for adoptive parents: - To move from rescuing to responding - To set adoption-sensitive limits and ground rules - To have connecting conversations - To help your teen envision their future Parenting in the Eye of the Storm contains invaluable insights for adoptive parents and simple strategies you can use to prepare your adopted teen for the journey ahead and strengthen the family bond in the process. It provides answers, guidance and understanding - working as a road-map through the tempestuous teenage years. Katie Naftzger maintains a private psychotherapy practice in Newton, MA. There, she sees primarily adopted teens, young adults, parents and families and leads local and online groups for adoptive parents. She is actively involved in the adoption community and has spoken at many local and national organizations.